Love it! Looks great and is comfortable! Great buy! Place drinks and appetizers atop the 5mm tempered glass table top and set the scene for a casual outdoor hangout with the Delano 4-Piece Patio Conversation Sofa Set by Westin Outdoor. Crafted with an aluminum wicker inspired frame and padded cushion seats, this sofa set is the perfect addition to your outdoor living space. The upholstered polyester fabric seats are available in 3 vibrant colors, making this conversation sofa set a must-have for any patio space and is weather resistant for lasting durability. Dimensions 27.55 In. X 51.2 In. X 31.5 In. Set even nicer in person. Looks awesome in the space. I was worried that it wouldn't be strong enough but was pleasantly surprised by how sturdy it is. Thought the seats may be small but they are large/roomy and very comfortable. The cushion color was not as bright as the picture but I actually prefer the darker shade of orange. Overall I am very pleased with the purchase. The price cannot be beat! If you're looking for a set and have doubts.......rest assured this one will be perfect for your space. I ordered this without showing it to my husband so I was nervous about him not liking it. It showed up in the middle of a dinner party and our UPS driver asked for some help unloading the box. Of course, by this time everyone was cracking jokes about the box being so big and my husband not even knowing what it was. Well, he put it together this morning and told me how happy he was that I ordered it. It's truly perfect for our patio. We got the grey and it goes wonderfully with our rugs and eating area. We set it up slightly different because we have a firepit - we used the table as a larger table between the two chairs instead of as a coffee table and it looks great! The quality is good and everything feels sturdy. We are quite happy with our little patio set and can't wait for our next guests to enjoy it with us! I absolutely love this outdoor set. I’ve been looking for something affordable and it had some good reviews. I received a lot of compliments on the set. The reason that I didn’t give it a full 5 star is because original delivery I received, one of the parts for the sofa seat was incorrect. I had to call several times to try to get this issue resolved. Every time I called to check status each rep advised my delivery was on its way but I never received email confirmation. It wasn’t until about 10 days later, someone from overstock called to advise they wanted to advise me that they are sending me new set. I was under the impression that the parts were shipped already but that wasn’t the case. They offered me a measly $5 credit for the inconvenience. What is $5 going to do? Spent over $400 for this set. One hand didn’t know what the other hand was doing. But overall after weeks of bad communication my set is together and nice quality. My 3 star is specifically for customer service. So I was really skeptical about buying a patio set online but we love this patio set. It is absolutely beautiful and it was super easy to put it together. Can’t say enough about surprised I am but this truly is a great buy! This patio set is so beautiful. Looks exactly like the picture.Delivery was fast and everything was intact. The only problem was it took about 2 hrs to assemble, but i must say its wort it!. 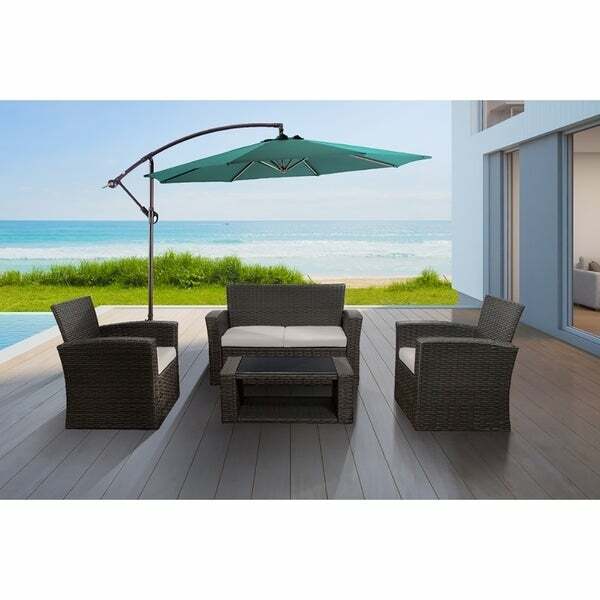 I absolutely love it , it came so fast and it looks amazing in my yard very comfortable and easy to assemble the cushions were much thicker than expected ,excellent quality product . I would definitely recommend this product to other shoppers . We just put together our conversation set this afternoon. It took several hours because the holes weren't all big enough for the hardware, but we were able to get it together and it looks pretty good. For the money, I'd say this set is worth it. It will be interesting to see how it does through the winter - we plan to cover it with patio furniture covers. All in all, I'm satisfied with the purchase. This set is really nice, very sturdy and comfortable. I do find the cushions on the thin side, but they are comfortable. This set looks really nice too, it’s perfect on our patio. Sturdy good looking and comfortable. Exactly what we were looking for. The furniture itself is good looking furniture. The cushions are not cheap looking or feeling, although the holes did not align in either of the chairs which caused us not to be able to utilize one screw per chair. Considering this fact it makes me nervous for someone to sit in the chair. Other than that the furniture is sturdy and well made. I have not receive Box 1 of this order. Box 2 was received March 22. Box 1 was not delivered and even though it shows delivery date of Narch 22 as well, it still shows it in transit and approximate delivery date has not been changed. We are in the process of moving so if this is not delivered by April 1st I will have to return the box 2 and will be expecting a full refund. Love this set. It's amazing an fits my patio great. Worth the price. Nice an sturdy. This set is wonderful! It is stylish and comfortable. It provides a nice variety of seating. It is lightweight and easy to move around. We have gotten lots of compliments on this set. It was a great value! "Which covers fit this set best?" I chose this set due to the rave reviews and the price. "Can I purchase this item silver "
Do the bottoms of the sofa and chairs have a webbing or strapping? Just inquiring to see if it is comfortable to sit on. Many products like this are very rigid and have no flexibility or webbing or strapping underneath the bottom cushions. Please advise.